Diving was something Frank, my husband, really wanted to do. He had been snorkeling for years during our previous holidays and when we were planning our 5 month trip this was one of his (few;-) requirements. The reason I wasn’t sure was because as a child I was very claustrophobic. I NEVER took the elevator, I was scared in confined spaces and a (what was supposed to be fun) family trip to the Caves of Han-sur-Lesse in Belgium had me kicking, screaming and crying the entire tour. Not so much fun for all the other people on the tour. I was afraid that diving would feel claustrophobic as well… However, I couldn’t have been more wrong! Diving is pure freedom… Well, besides the air and depth restrictions;-). But diving is the best, it feels like you are flying! Floating weightless through the water, no sound but your own breath and surrounded by colorful fish, the underwater world is truly a universe of its own. I thought I would be scared, but I was ecstatic instead. Up until now I have done 13 dives, so I am really still a diving newbie but I plan on doing a lot more diving on future trips! Anyway, back to the beginning of the story. Frank wanted to get his PADI and we decided to take a course in the Philippines. After all, a country consisting of over 7000 islands and a whole lot of ocean seemed like the perfect place! And it was:-)! Our PADI Open Water Course consisted of a 3-day program. The first day was a full day of studying! 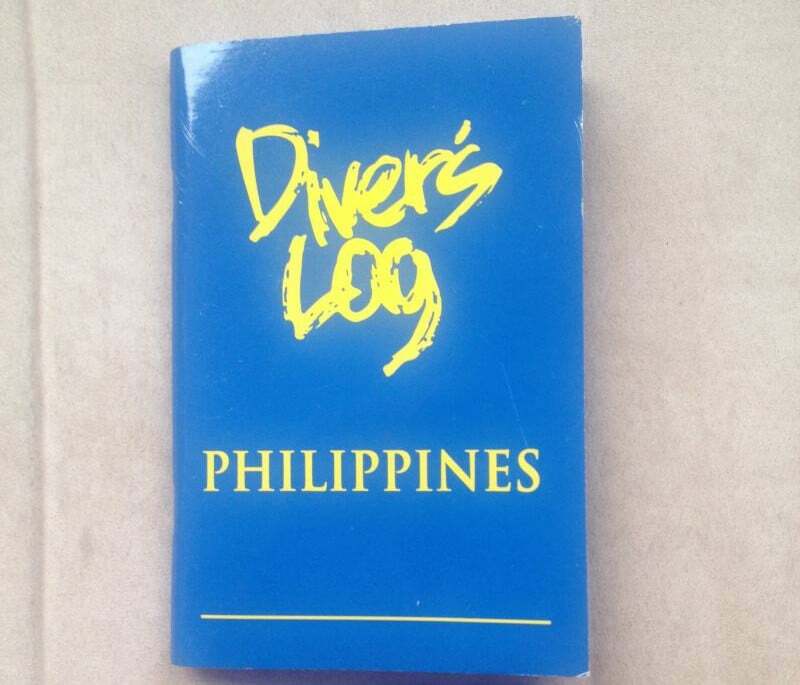 From our dive school, El Nido Puro Divers, we received our PADI Open Water book and a DVD-player with movies covering the same material as the book. 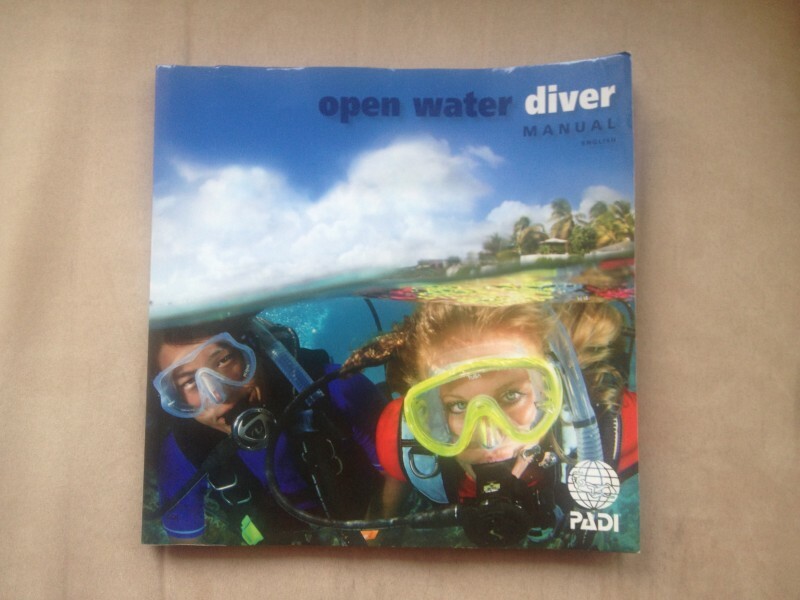 There are 5 sections in the PADI Open Water book (well, 6 if you count the introduction). On day 1 of our PADI course we studied chapter 1-3 in our book and watched the accompanying videos. Each section of the book ends with a couple of exercises, which helps you test yourself and make sure you know the material. The material is not difficult but it does require focus and concentration. We studied in our room, I suggest finding a place that helps you being focused without too many disctractions. I found it important to understand how things work underwater. Knowing what to expect and how to deal with problems (in theory that is;-) made me feel more confident about going diving. You’ll learn how to use these charts… No worries, I didn’t have a clue how to read this either before taking the course;-). In the afternoon of day 1 we met up with our dive instructor Lenoel and went through the theory. Lenoel answered questions we had and he tested our knowledge by asking us about the material we studied. Our knowledge was deemed sufficient to go ahead, the next day we would go diving! I was super excited about this day, we were going diving for the first time in our lives! With a solid breakfast (actual multigrain bread, juj, and a fruit shake) in our stomach we hopped on the boat of El Nido Puro Divers and headed to our first dive spot near Helicopter Island for Confined Dive #1. On the beach of Helicopter Island our dive instructor Lenoel explained how all our equipment worked (which we learned about in the book and saw on the video, but repetition is key in helping you remember;-). And then… we walked into the water, strapped on our gear and descended to the sandy ocean floor, just 3 meters below the surface but we were diving nonetheless! As this was Confined Dive #1, we did several exercises, like taking out our regulator, flooding our mask and emptying it again and using each other’s alternative air supply. Even in this relatively ‘boring’ part of the sea (no coral, obviously, otherwise we would damage it by stepping upon the coral) there were still plenty of fish swimming around and I was super excited about the pretty underwater world. NOTE: DON’T EVER STEP ON CORAL, YOU WILL KILL AND DESTROY IT! We stayed below the surface for about an hour and a half doing all sorts of exercises before we ascended and hopped in the boat to visit the next dive spot: Miniloc! This is where we took our first Open Water Dive! 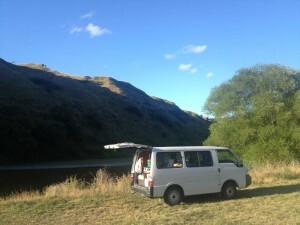 We didn’t have to practice any skills, but could focus entirely on the amazing surroundings… So cool! After a delicious lunch with lots of fish, rice and some vegetables we headed to our last dive spot of the day, which turned out to be our favorite because…. we saw a sea turtle! It so happened to be that seeing a turtle was one of Frank’s bucket list items, lucky us! We also saw giant clams which shut it you clap near them and underwater plants that shrink/hide when you carefully move the water close to them, so fascinating! After 3 dives we were pretty tired, but our day wasn’t over yet! Back in El Nido town we studied the rest of the day for our PADI Open Water exam which we took that evening. Luckily we passed, juj! I am the proud owner of not 1 but 2 PADI passes:-). Another wonderful day of diving, I couldn’t have been more excited after the amazing experience of the previous day. At our first dive spot of the day, we did our Confined Dive #2 and practiced the last skills, like taking off our BCD under water and putting it back on and taking off our mask and putting it back on. I have been wearing contact lenses since I was 12 (I used daily contacts on dive days) and I was a little worried this would be a problem, but it really wasn’t! If you wear contacts like me, just keep your eyes closed when you take of the mask and ask your buddy (Frank in my case) to stay very close to you while doing this and help you if necessary. After putting your mask back on you just have to blink a lot to get the salt water out of your eyes, but that’s also the case if you don’t wear contact lenses;-). Anyway, after completing all necessary skill exercises for Confined Dive #2 we were free to roam the reef for a little while before getting back to the surface. Back on the boat we sailed to our next dive spot, Puglugaban, where we saw a lion fish, parrot fishes, 2 sea turtles and lots of different coral… After 45 magical minutes we had to head back up but this was such a great dive spot! • Theory and exam: studying the book, doing excersises and taking an exam to test your knowledge. • 2 Confined Dives: these can take place in a pool, but in our case took place in shallow water near a beach. During these dives you’ll focus in practicing your skills. 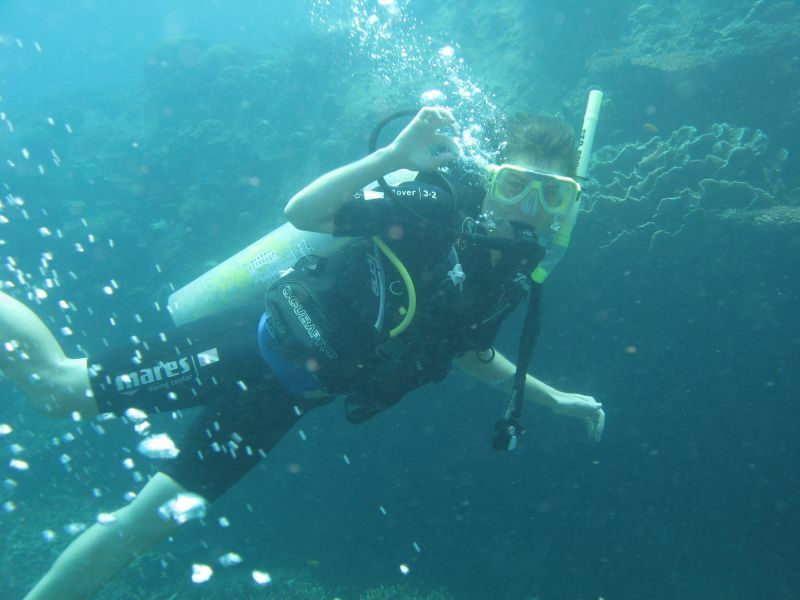 • 4 Open Water Dives: during these dives you can enjoy your wonderful surroundings and get more experienced as a diver. Overall, I was very happy with our PADI Open Water Course with El Nido Puro! We were the only two students, which meant we had our instructor, Lenoel, all to ourselves and could ask everything we wanted. This also meant we only had to wait for each other to finish the required exercises, leaving more time for ‘regular’ diving! Our dive instructor Lenoel was great! He was fluent in English, patient, explained everything clearly and if we didn’t understand it, he explained it again or better yet, he showed us what to do. I never felt unsafe underwater as Lenoel was always checking to see how we were doing. Which we always responded to with the ‘yes, I am okay’ signal as you can see in the picture below:-). The equipment we used was in excellent condition and there were always spare items on board, like back-up snorkels and weight belts. The boat was a traditional Philippine boat, with the floaters on the side. Lunch was usually prepared on deck and very tasty (lots of fish, some vegetables, pork and of course rice;-). The El Nido Puro Diver shop is located in the middle of El Nido, in the map below you can see the exact place. You can check their website for more information. The one thing I feel could be improved about the course was a little more focus on how to assemble our gear and in which order to perform our necessary buddy checks. We did check our gear and each other’s, but not following a standard pattern. And we only learned how to assemble our own gear when we went diving on Tioman in Malaysia. So even though it is very convenient to have your gear assembled for you, I find it important to know how to do this myself. Which is why I recommend that you ask about this before booking a PADI course, or even during a course if you feel this isn’t getting enough attention or if you have questions/are unsure what to do. Which I should have done as well, I am sure Lenoel would have gladly explained everything and let us practice more. Anyway, diving is all about safety, so there is no such thing as a stupid question or being too careful. After all, better safe than sorry! 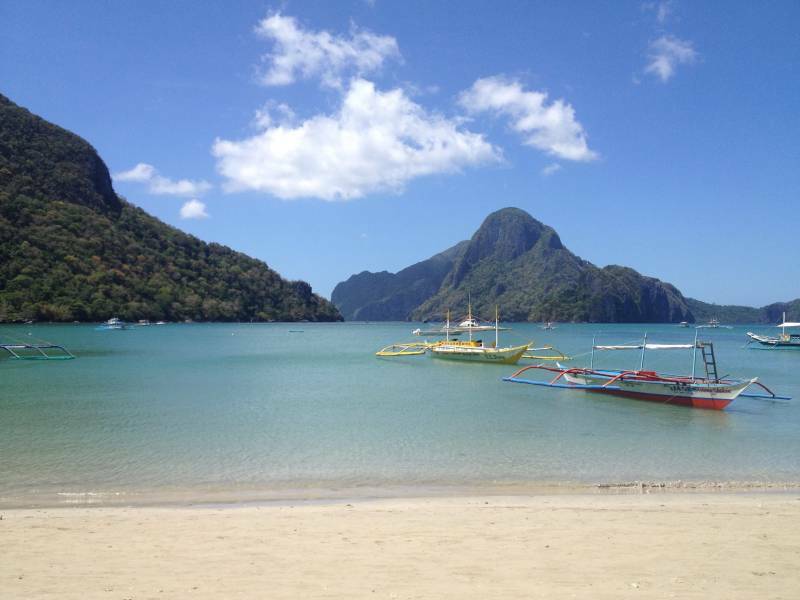 How much does a PADI Open Water Course cost in El Nido? We paid 39.600PHP for the course, which means 19.800PHP per person. €817,29 (approximately $900) was deducted from my credit card which obviously didn’t give me the best exchange rate but I didn’t have that kind of cash with me so no choice;-). This is certainly more expensive than other places in Southeast Asia where you can get your PADI, such as Koh Tao. Nevertheless, I don’t regret spending this money for one second and feel that we definitely got a lot of value for our money. The dive spots were amazing and better than Koh Tao where I did my advanced PADI course! In this little book I log my dives, writing things down like ‘Bottom time’, ‘Tank start’ and ‘Tank end’ and how much weight I had on my belt. The dive spots around El Nido were phenomenal… The coral was incredibly varied and we saw a lot of cool fish during our dives, like a lion fish, several blue spotted stingrays, groupers, yellow tale barracudas and we also found Nemo;-). The cherry on the cake was seeing the sea turtles as this was one of Frank’s bucket list items. Our instructor told us that during a dive in January he saw a whale shark! Definitely something very high on my wish list, BUT… only when I can see one in its natural habitat. There are lots of other dive sites around El Nido and it probably doesn’t matter which one you go to, because I expect they are all amazing! Also read: Top 10 things to do on Palawan. Getting our PADI Open Water Certificate in El Nido was certainly one of the highlights of our 3-week trip around the Philippines and of our 5-month trip. After getting our PADI Open Water we also went diving at the Perhentian Islands and Tioman in Malaysia, got our PADI Advanced Open Water at Koh Tao, Thailand and I explored the wonderful underwater world of Cuba. And, as I said before, I hope to be doing a lot more diving during future trips! Share your experience by leaving a comment! Thanks for the very thorough explanation on learning how to dive and getting the certificates. I’ve been snorkeling but I don’t think I’m ready for diving quite yet. Looks like you have a blast! Very welcome Sue! And snorkeling is great as well! Me too, wouldn’t have wanted to miss such an amazing experience! That sounds like a magnificent experience! You did it! You’ve accomplished!! despite that fear and worry! I’m not so sure about diving, yet. haha, I’m not claustrophobic, but I really have fear of open water: lake, bay, centote, ocean – especially open ocean. I mean…that thought just gave me the chill. I’m slowly trying to fight that fear by swimming in the lake, jumping into the cenote, and went scuba diving in shallow ocean. Haha, it wasn’t easy indeed but I’ll get there, baby steps. haha, but I’m happy that you did it! It makes sense for you to do this, especially since it’s Philippines where tons and tons of islands are there. I thought it would be dark too! But even at 30 meters deep it absolutely wasn’t. I did night diving and yeah, that was dark. Pretty magical as well because of the plankton that lit up like tiny stars when we turned off our flashlights and waved with our arms. I’m so glad you were honest about your trepidation about diving (and that you ended up loving it). I’ve not been diving before, but I have to admit, I’m a little nervous about it. I thought I was the only one! Just wait until you get to 100+ dives. Originally, I just loved diving. At about the 100 dive mark, I started not wanting to dive if the conditions weren’t good. Also you should go dry suit diving in Iceland. It’s amazing. Haha, it’ll be a while before I am at 100+ dives. But I am planning to go diving on my upcoming trip to Cuba:-). Dry suit diving in Iceland is on the bucket list, I hear it’s amazing! Yes, the personal attention was a definite plus and if you want to get your PADI, the Philippines are a great place to do the course! I have heard great things about diving in the Caribbean, would love to go there and check it out! Sharing this immediately! I have so many readers who would love this sort of information at their disposal. Thank you for sharing this with us! Glad to know you had a good PADI experience in El Nido. I had mine in Batangas (cheaper indeed ) and also good service, but hey, you were in one of the best beaches so that matters!